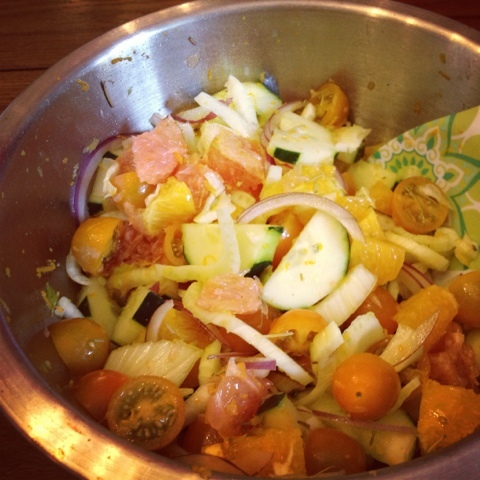 Tonight we're whipping up a quick & colorful citrus salad. It's the perfect spring salad, comes together in about 20 minutes and is our idea of good food fast. Who has hours to cook dinner after a long day? We certainly don't! But quick cooking doesn't have to mean hitting up the drive through of shame either. Tonight we challenge you to join us for 20 minutes in the kitchen and cook up a delicious & nutritious dinner we can all feel good about eating! Tonight's salad starts with bed of nutrient dense baby spinach. We toss this with a combination of fresh grapefruit & oranges, fennel & cucumbers for crunch and grape tomatoes & red onion to finish. We top our salad with grilled orange chicken and a light vinaigrette of 3 parts orange juice to 1 part olive oil for the perfect citrusy dressing. 1. Heat grill pan to medium high heat and add 1 tsp olive oil. Season chicken breast with salt & pepper and grill for 4-5 minutes on each side. Before removing from pan, add 1 tbsp orange juice and flip chicken in pan juices to glaze. 2. In mixing bowl, whisk together remaining orange juice, olive oil, garlic, rosemary and zest of two oranges. 3. To dressing add in chopped fennel, halved grape tomatoes, segmented grapefruit & oranges, chopped cucumber and thinly sliced red onion. Stir to combine. 4. 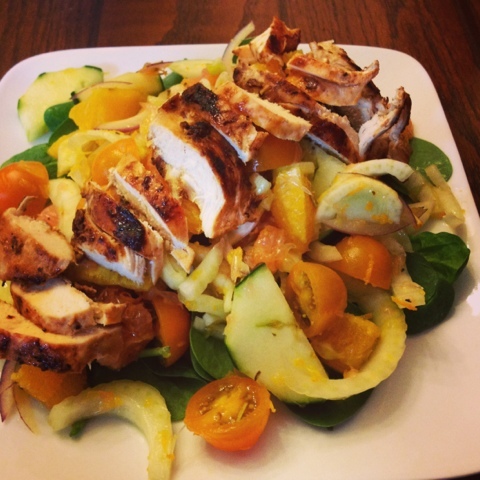 Plate up a bed of baby spinach, top with 1/4 of your citrus salad & dressing and finish with grilled chicken breast. Great post! Yum ~ looks good. I'm visiting you today from Follow Friend Friday. I'm following you on Bloglovin. I hope you get a chance to stop by my blog and comment, too! This looks great! I'm always tempted to buy fennel, and even did once, but I never know what to do with it.